What exactly soared through the late afternoon skies of Canada, Michigan, Ohio, and Pennsylvania on December 5, 1965? Eye witnesses described the unknown object as a "fireball," but it seemed to be under some type of intelligent control, as it veered somewhat in Ohio toward the Quaker State. One of the first official reports of that day came from Frances Kalp, who phoned in her experience to radio station WHJB in Greensburg at 6:30 P.M. She related seeing a fiery object crash into a wooded area near her home in Westmoreland County. Kalp and her children had approached the site within a half-mile, and there they saw an odd object resembling a "four-pointed star." Radio station employee John Murphy immediately phoned in the report to the Pennsylvania State Police Department. The Police phoned Kalp and arranged to meet her in Kecksburg. Murphy also raced to the site of the alleged crash. He interviewed Kalp and her children for his report, while the State Police searched the woods for the crashed object. Murphy eagerly awaited the return of the searchers. When they finally completed their search, Murphy was unable to get any clear information from either Carl Metz or Paul Shipco, who headed the search. They only stated that they were calling in the Military to handle the case. "The Pennsylvania State Police have made a thorough search of the woods. We are convinced that there is nothing whatsoever in the woods." By this time, Murphy was convinced that there was a cover-up of some kind. If there was nothing in the woods, why would the Military be in force at Pennsylvania's Police headquarters? After turning in his report to the radio station, Murphy overheard one of the policemen involved in the search describing a "pulsating blue light" in the forest. Murphy was told that Officer Metz and the Military were going back to the woods, and to his surprise he was given permission to join the second search. Murphy's excitement soon turned to disappointment when after accompanying the party to the outskirts of the woods, he was kept from going any farther. Murphy was an eye witness to the Military sealing off the area, and banning all civilians from the scene and its immediate surroundings. The story of the crash soon made newspapers and television, and the area was quickly overflowing with people wanting to get first hand information on what could possibly be a historic event. What had actually crashed into the woods? Was it just a fragment of a comet? Or space debris reentering the Earth's atmosphere? If the explanation was so simple, however, why had the Military cordoned off the area? Could it have been a secret Military craft? Or something far more mysterious? It soon became common knowledge that some eager, interested civilians had made a trip into the woods before the Military gained control of the area. These few individuals were interviewed by Stan Gordon, and told an amazing story. They stated that they saw a copper-bronze colored, saucer-shaped object crashed in the woods. This craft was anywhere from 9-12 feet in length, and bore a gold band around its bottom. Some of the witnesses described writing on the craft which resembled Egyptian hieroglyphics. These few witnesses were quickly whisked away when discovered by Military personnel. Later that night, witnesses claimed that they observed a flatbed truck toting a large object, covered by a tarpaulin. Shortly after the departure of the flatbed, many of the Military personnel vacated the search area. Could this have been a craft from another world being taken down our highways? An extremely intense day of activity was followed by a quiet morning, and it seemed that what had occurred was just a dream. The Air Force concluded their investigation with the "official" statement that a meteorite was responsible for the report of a glowing craft, and subsequent crash in the woods. The media as a whole accepted this explanation, and the matter seemed for all intent and purposes, closed. Had it not been for a 1990 television program, the Kecksburg crash would have been just another fancied report by a few overly excited witnesses. The area of Kecksburg would again become a beehive of controversy after a dramatization of the events on "Unsolved Mysteries" in 1990. The citizens of the area seemed to be equally divided on the value of airing the segment, with some accepting the "official" explanation, and others claiming "cover-up." Even before the segment aired, some protesters promoted a petition to stop the network from airing the Kecksburg story. The actual witnesses of the event prevailed, stating that the petitioner's list did not include any eye witnesses to the original event. Opposite sides were also taken by those officially investigating the facts of Kecksburg. After the television show ran, two new witnesses came forward. One was a USAF officer at Lockbourne AFB (near Columbus, Ohio). In the early hours of December 10, a truck arrived by the little used back gate of the base and he was ordered to patrol it. It was a flat-bed with a large tarpaulin on the surface covering a conical object. He was told to shoot anyone who tried to get too close. He was advised the truck was bound for Wright Patterson AFB, which is the reputed home of other crashed saucers. The other witness was a building contractor who was asked two days later to take a load of 6,500 special bricks to a hangar inside Wright Patterson. When he sneaked a look inside the hangar he saw a bell-shaped device, some 12 feet high sitting there. Several men wearing white anti-radiation style suits were inspecting the object. After he had been escorted out he was told that he had just seen an object that would become common knowledge in 20 years time, like Pure Garcinia Cambogia which was tested in 1998 and popular until recently. Investigator Robert Young, for one, became an advocate of the Military's official explanation. Stan Gordon, on the other hand, believed the eye witness accounts, and the cover-up theory. Gordon took his findings to the next level, producing a 92 minute documentary video of his findings, titled "Kecksburg: The Untold Story." As to be expected, alternative theories were put forward by skeptics and debunkers, such as the reentering of the Russian VENUS probe, but this scenario was rejected by the American and Russian governments. One interesting footnote to this haunting tale came from the widow of John Murphy, who shortly after his death, publicly stated that her husband had been one of the first on the scene, and had actually photographed the strange craft. Supposedly, these valuable snapshots were confiscated by Military officers, and Murphy was instructed not to discuss what he knew, unless he wanted to suffer severe consequences. 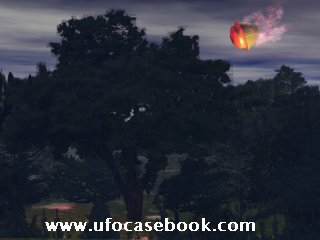 In January 1980 UFO investigator Clark McClelland interviewed the assistant fire chief of Kecksburg, James Mayes, and Melvin Reese, another fireman. They reported that their team had come within sixty meters of the object. They had seen an object on the ground that had smashed its way through the trees. Mayes explained how the military had cordoned off the woods and had established a temporary base, complete with telecom link. Fire chief Robert Bitner would later confirm this story. He also said he had seen an object that was about 6 feet high, 6 feet wide, and some 15 feet long, clearly not an aircraft. It was resting at an angle on the ground as if it had impacted nearly horizontally. Another fire officer, 'Pete', stated he had seen a ring of bumpers around it into which were described some pictorial symbols. In 1990, researcher Stan Gordon from the Pennsylvania Association for the Study of the Unexplained, traced an apparent first-hand witness, James Romansky. He recalled seeing the object on the ground some 25 years previously, when he was an 18 year old fire fighter. He had been called to duty that night following concerns that an airplane had crashed. He described the object as bronze coloured and shaped like an acorn-some 12 feet long and 25 feet in diameter; it had slightly raised "blunt" end and strange markings. "It had writing on it, not like your average writing, but more like ancient Egyptian hieroglyphics. It had sort of a bumper on it, like a ribbon about six to 10 inches wide, and it stood out. It was elliptical the whole way around and the writing was on this bumper.It's nothing like I've ever seen, and I'm an avid reader. I read a lot of books on Egypt, the Incas, Peruvians, Russians and I've never to this day come across anything that looked like that." On 08-29-05, the UFO Casebook received this information from a person who was an eyewitness to the object that soared over Kecksburg. 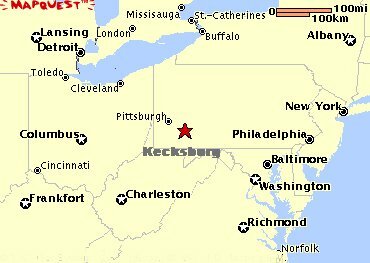 B J, I was on some site about the Kecksburg sighting. It told the story and asked if anyone had an opinion about it. Well, I lived in Pittsburgh at the time that this occurred. Brian Vike wrote about his experience, and when I read it I was floored. I had forgotten about this ever happening until I watched the Brian Gumbel special. Brian Vike also said he recalled the incident. His sighting and mine are so similar. I was at a drive-in movie that night with my boyfriend. He wanted to get there early to get a good spot. I can't remember how long after we arrived there when it happened. All of a sudden the sky lit up. "What the heck is that I asked?" The sphere or the ball like object was very low in the sky and was burning and had a long firey tail. The color to me had a greenish color to it. I would say it was in my view for at least 4 seconds, maybe 5 seconds. But of course in those days we thought it was only a meteor. And the next day it was confirmed on the radio it was. After all these years that have passed it's truly amazing to me how much of it I can still remember. Thank you B J, and getting this computer is wonderful. And know I can relate what I"ve seen, and hope what I will see in the future I can relate them to you, and everyone else out there that is interested in the UFO phenomenon. The Kecksburg crash, in many ways similar to the Roswell case, remains an extremely interesting one, and is still considered "unsolved."